Weather temperatures have you confused? Annually here in Central Virginia, it seems like each February there is a temperature spike with a 4-5 day warming trend that really gets the fishing juices flowing. 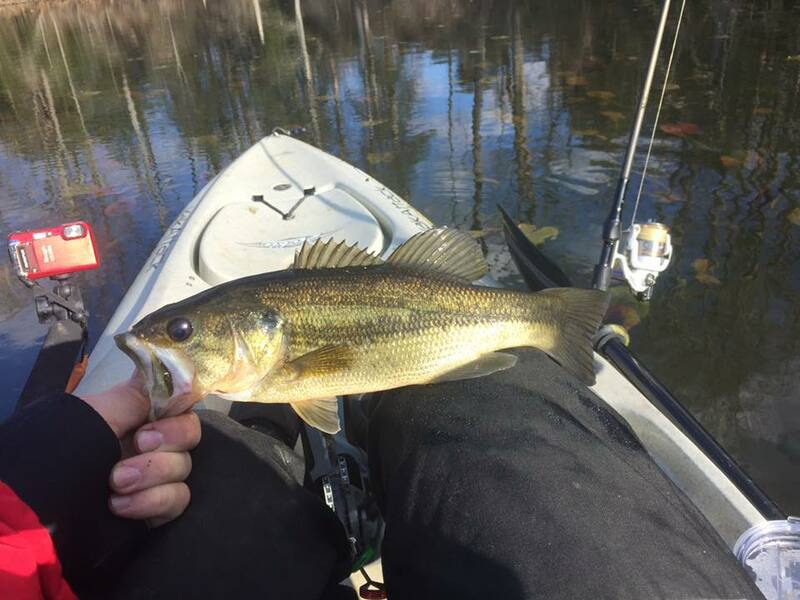 I was fortunate enough to spend two days chasing a bite at a local pond. While the air temperatures were in the low 60's, the water temperatures were still in the mid-40's. As the picture above clearly depicts, I was not venturing out without proper cold water layers - thank you #Kokatat! 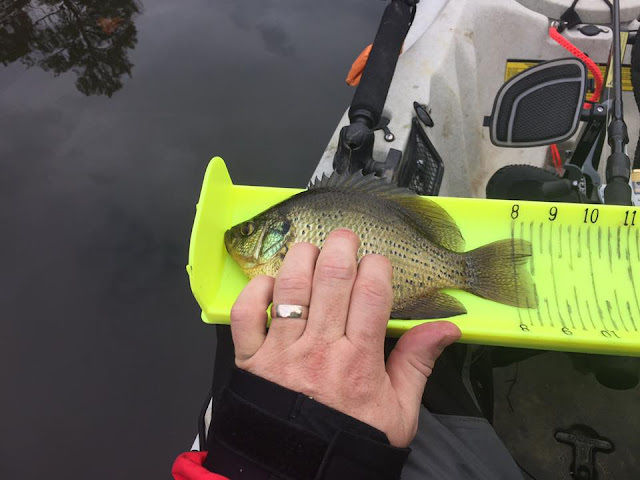 The bite was fairly slow, but I managed to convince a variety of species into the kayak using some trusty PTL JP Hammershads on the end of the line. The winning ticket on both days was a slow retrieve over submerged wood with the bait smacking into it and then a subtle pause/drop afterwards. Since there were no storms of late, the shallower areas had crystal clear water and required a greater level of stealth. The new Hobie MD180 Mirage Drive (which I borroed from my 2017 Hobie Revolution 13) was crucial in these moments as I was able to reverse my motion with one simple pull of the cable. I could then make a longer cast to the target area and work it over slowly and methodically. 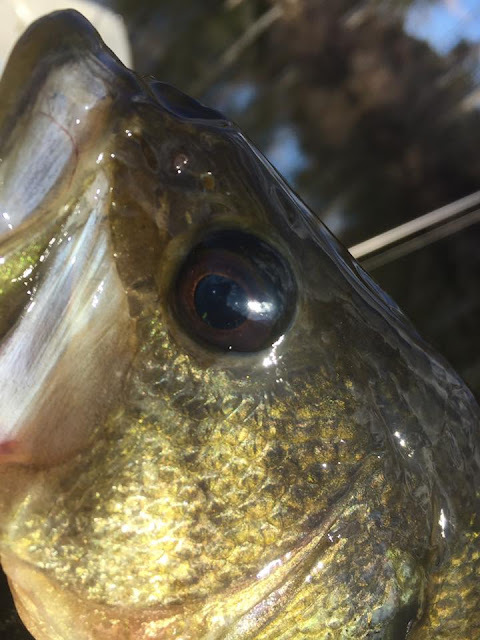 While I didn't have tremendous success, I did complete the two trips with 4 Largemouth Bass, 2 Fliers, 1 Bluegill and a massive Chain Pickeral that was well over 22" and fat but snapped the lightweight leader too easily when he choked the Hammershad and made a snap turn. A great weekend nonetheless! It felt amazing to be back on the water again. Bigger fish are on the way - I promise! I'm already looking forward to my next outing! Stay safe and get on 'em! This year is one in which I plan to make a more concerted effort to get on the water more. Last year was brutal for me with various issues plaguing my fishing endeavors. Time to turn over a new leaf and start this year off right. What better way to do that than with a new hull!! That's right - new to the fleet this year is the 2017 Hobie Revolution 13 with the Vantage CT seating and MD180 Mirage drive! 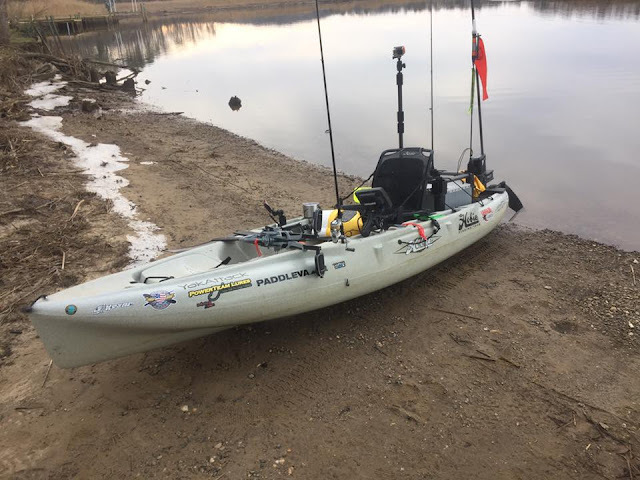 My first Hobie was the Revolution 13 and helped me get on several new species and several quality fish, so why not give it another go. My first fishing related activity was representing Appomattox River Company, the Hobie Fishing Team, and the YakAttack Regional Fishing Team at the annual Richmond Fishing Expo held in January each year here in Doswell, VA. While working this expo, I had the opportunity to share the floor with several other skilled anglers that I look up to and admire. Kayak anglers such as: Kayak Kevin Whitley, Rob Choi and William Ragulsky (all from Ocean Kayak and Johnson Outdoors); Aaron Dryden and Mark Lozier (Wilderness Systems); Dinver McClure and Eric Schrock (Feel Free Kayaks); Josh Dolin (Jackson Kayaks) and Grant Alvis (fellow Hobie Fishing Team member). We spread the knowledge of our respective brands as well as helped the expo attendees understand the benefits and limitations of each hull relative to their fishing style. 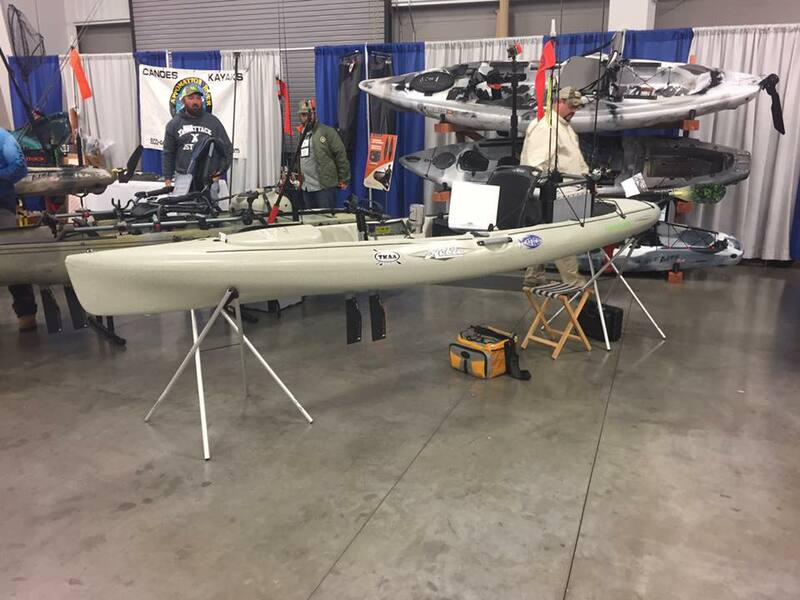 During the expo, Vic Sorensen led a couple seminars on "Choosing the right kayak and rigging it for fishing". Eric and I had our kayaks on display and helped the seminar attendees understand the thought process for our respective rigging options based upon our fishing styles. I loaded up the Outback for this trip, since it was the only hull I had with GearTracs and the PowerPole Micro installed. I figured it was the best option given that the winds were forecast to pickup as the day wore on - I'm glad I did! The winds were a tad blustery for sure and made the float back to the target area very cold. After setting up at the first spot, I was watching a family of river otters frolic up ahead when I felt the line go heavy. I set the hook and was rewarded with my first fish of 2017 - a feisty 10" yellow perch. That was until a stronger hit came about an hour later and the light drag started pulling - could this be the long awaited big one? 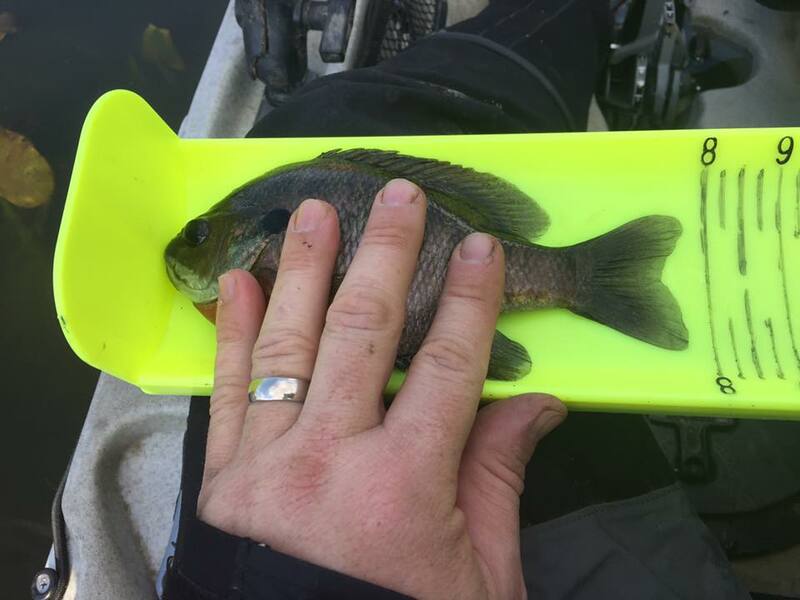 The magic mark is 12" for a VA Freshwater Citation in the Yellow Perch species........ Alas, it was not to be, but at 11" and fat, this was a nice fight on light tackle and a light drag. It was a great day, albeit very cold. If you are going to be heading out for any water activities, make sure you are properly outfitted for the trip. I was armed against the cold with my trusty Kokatat dry suit, and the proper winter layers underneath. I even had a proper hat in case the winds turned too nasty and strong. When in doubt, ask a veteran kayak angler that has fished in cold weather or consult the good folks at Appomattox River Company. They have all the gear you need to hit the water safely and comfortably. Until next time - stay safe and warm!